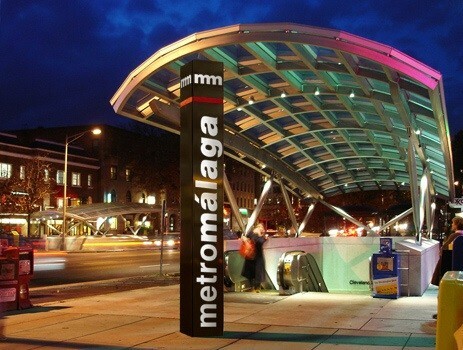 Málaga, one of Europe's most historic cities, is building a much-needed new metro / subway rail network. And with the expertise of PA / VA integrators LDA AudioTech, Iconyx beam steering systems will make individual station announcements crystal clear. The main economic and financial centre of southern Spain, Málaga thrives on tourism, construction and technology services, while other sectors such as transportation and logistics are beginning to expand, with the growth of the Andalusía Technology Park (PTA) setting a fine example. "Iconyx modules, both the digitally steerable IC24 with its multiple individual beams, and the 37 mechanically steerable IC7s that we installed in the 160ft (49m) long by 164ft (50m) wide booking halls, offer great audio quality and intelligibility in covering large areas," continues Diego. "So, by using just one IC24 for each platform, it was possible to achieve even sound pressure distribution along the area, avoiding acoustic shadows that could be created by concrete beams and columns. Another great 'plus' is that they are very easy to install and maintain, with no need for a complex wiring infrastructure. As he notes: "Delivering pure announcements is very important to every passenger. And in the Metro Málaga it's remarkable to be able to say that in every zone the STI is approximately 0.6 or higher, so it has speech intelligibility of a quality similar to that found in most concert halls."